With her umbilical cord buried in the roots of her beloved pachota, this Mazateca child is tied to the land in a very real way, and when she sleeps, the pachota brings her dreams of becoming a heron, flying along the river. Domi’s gorgeous acrylic paintings, on a rich palette of jewel-like tones, complement this quiet little story of an Indian child secure and at home in the loving arms of her family and her world. Also available in Spanish. Highly recommended. 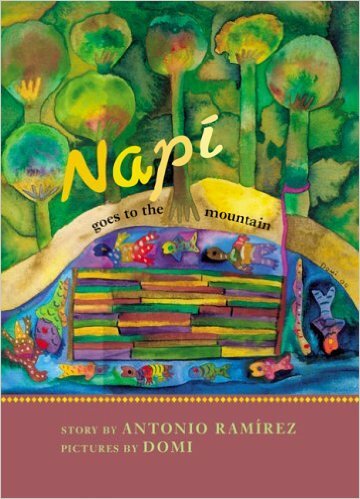 One evening, Napí’s namí (father) does not come home from working in the field, and his worried friends fear he might have been taken away. A nightlong search in the mountains yields nothing, so the next morning Napí and her little brother skip school and go to search for him. Upriver and in the jungle, they find themselves transformed into deer and are guided by turtles, storks, a coral snake, a bat, a mouse, and an armadillo mama, who tells them, “The family is finally together again.” Accompanied by the animals, who are “like brothers and sisters, children of the same mother, the Earth,” the children race home to a joyful reunification. 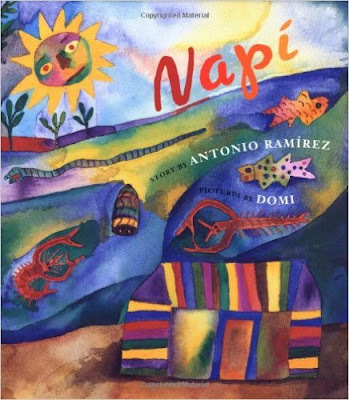 “It was so good to see him,” Napí says, “that I forgot to worry about where he had been.” Again, Domi’s amazing paintings, her bold colors this time surrounded by large areas of brown wash, are perfect. Had Napí’s father been taken by Chicón, the Lord of the Earth, or by el patrón and his thugs? We don’t know. As in Ramirez’ and Domi’s previous story, the impoverishment and terror of being Indian in Mexico (and in much of Latin America) is only hinted at, but it’s there. For many Indigenous children in the south, the threat of having your parents “disappeared” is a daily reality, and these stories, while not solely “about” this terrible situation, certainly place it in its political and social context. Also available in Spanish, Napí va a la montaña. Highly recommended. Domi’s bright, bold paintings of the lush jungle and Napí’s dreams are complemented by the browns and grays of portions of the land that the people have had to clear-cut for farming. 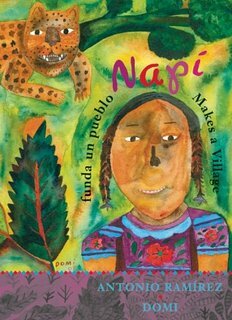 Told in matter-of-fact language that will resonate with young children, Napí funda un pueblo / Napí Makes a Village, without polemic, tells the story of what Indigenous peoples all over the world continue to face at the hands of rapacious and powerful governments. Highly recommended. Ramírez and Domi continue to work for Indigenous rights, especially with the Zapatista movement in Chiapas through their Colectivo Callejero, the “streetwise collective,” an organization they helped to found.